Home » Fiber » Can we spin this? Yes we can! Can we spin this? Yes we can! Isnt it amazing?! Its very literally a lovely bit of fluff. This did however set me back a bit! It was so gorgeous, and seemed so perfect just as it was, two rows of fluff balls joined together with a black cord. I didnt want to mess with it and ruin it. So I waited a while and thought about what to do. I decided that the obvious thing to do (at least to me cos its the first idea I had) would be to separate it all out, thread the balls and spin them into a yarn, one at a time. But the idea didnt seem right, firstly because I often try very hard not to do the most obvious thing I can think of, and secondly, because I didnt think it felt right to have such a variation of thickness between a spun yarn and these big bobbles, like it would turn out looking like an over-clipped poodle, and that wasn’t what I wanted. So I am pleased I didnt pick up the scissors straight away! What I did do though, is snipped down the middle, opening it out into a single length string of fluff balls. It occured to me that it looked tail-like. Also my 4 year old told me it was a doggy tail, so I figured I was on the right track. Then my eye fell on some yarn I had spun from a beautiful batt, one I had won from Black Sheep Goods during one of our SpinChats on Twitter. 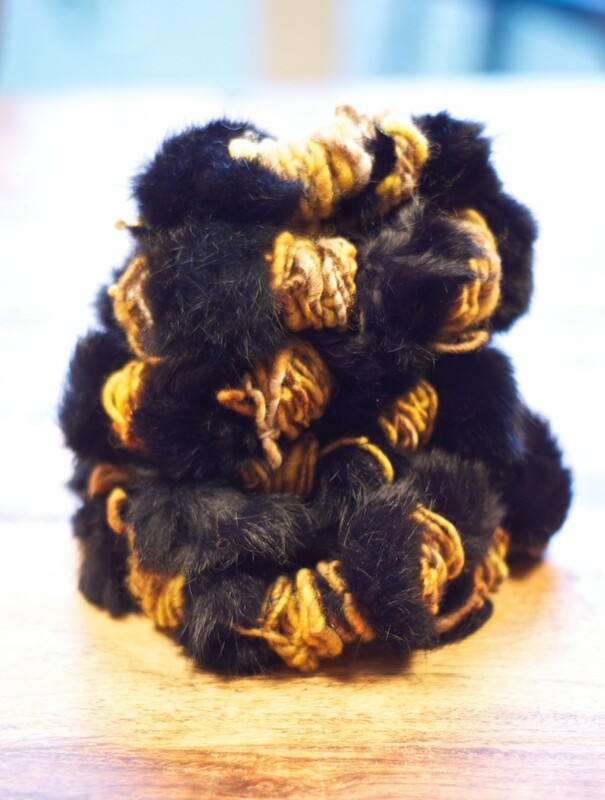 It was a glorious mix of golds and browns and I had really enjoyed spinning it, I had been thinking of weaving it but now I realised it was the perfect thing to join the black fluff balls! 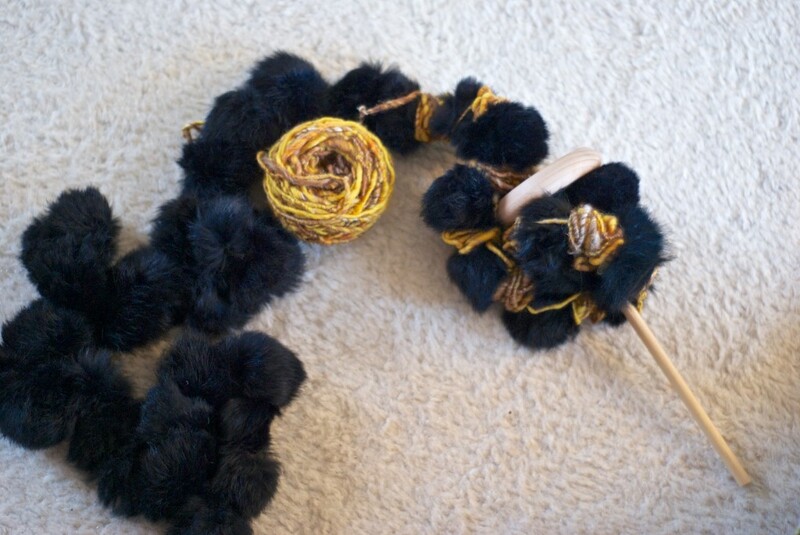 I knew straight away what I wanted to do, big big loose coils of gold between each fluff ball, building up the yarn to be almost as thick as the ball, making a nice long tiger tail! I like the idea of the horizontal coils against the softness of the fluff, and that the colours were just right, and the icing on the cake, both of these items that had fortuitously arrived in the post, almost entirely by luck and circumstance. Next all I had to do was work out how to spin it. This would be a challenge even for my Aura, I would have to bypass the orifice and guide hook for every ball, and there was no way it would fit on a bobbin anyway. So I got out my trusty bigass Louet Spindle. I figured out a system, I held the spindle out in my right hand and turned it, while holding the fluff stretched out in my left, also turning it so the twist didnt build up too fast, and then let the yarn hang from the middle, between the puffs, building up in one place at a time. Then I knotted each segment with a slip knot to anchor it in place before moving on to the next ‘between the puffs’ section and repeating. It was quite heavy work! As the length built up on the spindle it got heavier to turn, and it also started wanting to unroll because of the weight of the puffs. But I managed to get pretty much all of it on there ! I am pretty happy with the end result, I left a loop of chain plyed yarn at one end so it can even be worn as a scarf wrapped around the neck two or three times. I am happy that I didnt destroy the lovely fluff that Arlene sent me, and also that I was able to combine these two treasures to make something special. I am extremely curious to see what other recipients of the Can you Spin This challenge got and what they make with them! If you are interested in joining in, hop over to the Ravelry forum or the Spin Artiste page and let Arlene know, this is most definitely a great creative challenge and a fabulous way to start the year. Nuts! I really lol ! My husband came to see what I was laughing at even! Cool! It looks like Hobbes’ tail! So wonderful, you did a great job! I have totally different something to spin, but i am going to spin this week what to spin! It was a masterful effort! That s so cool! 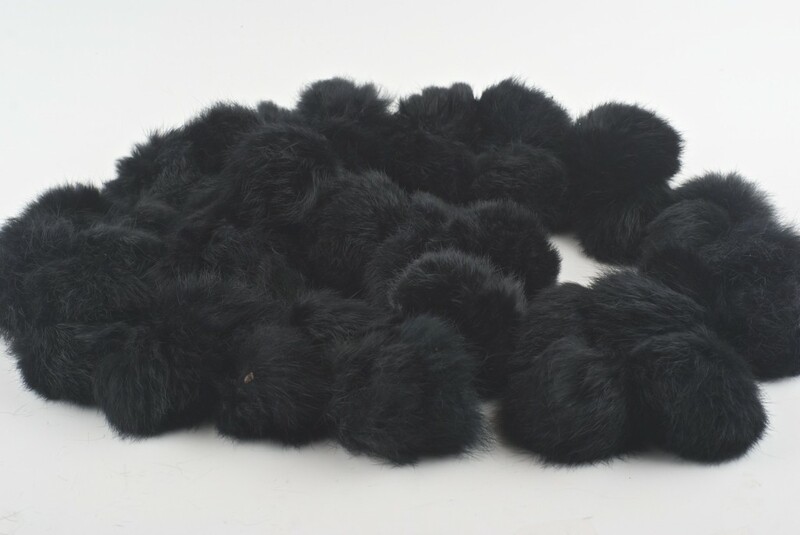 I have an old scarf that is made of balls of rabbitfur, maybe this would be a way to give it new life! I bet you could make something really beautiful with it Silja!